Composition - David Ward breaks the rules... again! Velvia – The End of a Legend? 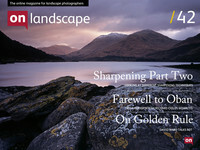 As you will know from Part 1 in the last but one issue, I spent over a week on Skye and Harris in the Outer Hebrides building up some stock landscape images in May of this year. Having travelled from Skye to Harris, I was enjoying the wonderful beaches with mountain backdrops around Seilebost and the Luskentyre Bay area. During my time on Harris, I experienced all four seasons, often within a very short period of time, including sun, rain showers and even snow. But this is what made the light so striking and much more interesting than would be the case with ‘wall to wall’ blue sky, which can be quite boring. One really important thing on a trip like this is getting the best image out of the camera possible, rather than relying on Photoshop afterwards. I find that when I’m shooting long exposure panorama sequences, which I often do, its not unlike working with large format, in that you might only have time for one or two sequences before the light changes, so you need to get it right first time! This has been a great discipline and has made me think ever more carefully about composition. Throughout my time on Harris, I would find that one minute I was driving along the single track roads and then, just round yet another bend, there would be a new photo opportunity. Often made through a combination of the raw beauty of the landscape and the weather systems moving rapidly across the sky. Its just as well there are a lot of laybys to park in! The first evening, I had planned to go to a beach called Seilebost hoping to see whether a sunset might develop. In fact, as I drove to the location, the weather was worsening by the minute. It was beginning to rain and big banks of grey cloud were moving in. By the time I got there, the rain had stopped, but the cloud remained. However, as mentioned earlier, I was keen to see what developed and it’s always good to be in such beautiful places, no matter what the weather. While the cloud didn’t disperse, I did like the effect of the sun shining through the grey cloud and lighting up the rocks on the beach. I believe it gives a sense of drama and a mood that befits the location. However, it was a little unusual that the weather was generally better during the day and then at dawn and dusk it was often cloudy. On my way back to the hostel, as it was getting dark, I discovered that it had actually been snowing on the higher peaks! However, a lovely retired couple called Geoff and Kine, who were also staying at the hostel, had the wood burning stove lit and a fine malt whisky was offered, and of course accepted. A great end to a wonderful day! Many photographers believe that the light during the day is too harsh for good landscape photography and this is a view I tend to subscribe to. However, this was one trip where I was getting opportunities to take photographs right throughout the day, from first thing in the morning until after sunset. They were long days, but well worth it! At one point in my trip, I got a brief opportunity for a mobile phone signal and phoned home to discover the weather was wet and cold in Northern Ireland. It later transpired this was also the same weather that Skye was experiencing, a mere 25 Miles away. Yet that particular day was a lovely sunny day on Harris and actually quite warm on the Outer Hebrides. There’s often no logic to the British weather!On another one of the evenings, I had scouted out a location, which was a small beach to the south of Seilebost, where I hoped to capture a sunset. It was difficult to access as I had to climb down a small cliff to get onto the beach. I was expecting the banks of cloud to come rolling in, but on this particular evening this wasn’t to be the case. While It wasn’t a dramatic sunset, I did like the composition and sense of peace. Unnamed beach, near Seilebost. Stitched panorama consisting of 8 images. By my final evening on Harris, I once again found my self on Seilebost beach, amongst the sand dunes this time. I had arrived in plenty of time to set up for what was looking increasingly like a nice sunset. After around 20 minutes, the light started to turn a wonderful rich golden colour, which lit up the sand and the grass on the dunes in the most stunning manner. I knew this would end up being one of those image’s you just know will work and it was a very fitting end to this part of my trip to get such wonderful light. Seilebost beach at sunset. Stitched panorama consisting of 9 images. To experience such pristine beauty, along with deserted beaches is what makes landscape photography on Harris so special. These moments certainly more than make up for all those cold nights spent in tents waiting for the light!However, by the next morning it was time to pack up my gear for the return ferry crossing to Skye. I still had 24 hours left on Skye before heading home, so I was hoping for a final evening shot at one of my favourite locations, Elgol on the west coast of Skye. I had also hoped to get a shot at a place called Glen Brittle, but when I got there, the cloud was too low and the light too flat to produce anything I was happy with. So on my way back, I passed Sligachan. Once again this is a location, which we often see photographed, most often with the bridge in the foreground. As I drove past, I noticed that heavy dark clouds were moving across the sky in the wind and the contrast of the sun in the foreground with the clouds over the mountains had potential. I stopped and got this image, which I hope is a bit different from what we normally see. I’m still not sure if I really like it, but I think it looks better in print form when enlarged to 80cm or more. The Cullins from Sligachan. Stitched panorama consisting of 10 images. That evening, I arrived quite early at Elgol and did some shots from a rock along the beach nearby to where I got a great image the last time I was here in February. The light wasn’t as good, but I thought there was a chance it might change. However, the tide was still coming in and I had to get onto higher ground before I was cut off. As I jumped from rock to rock, the inevitable happened and I slipped and fell in! Fortunately I had carried my camera bag over first, so it was only when I returned for my tripod that the inevitable happened. So, in water up to my chest, I climbed out very soggy with a ruined iPhone and my little Fuji X100 had also been submerged. Believe it or not, the Fuji survived, but the iPhone didn’t so, I’m now on my third one this year! Who said landscape photography is glamorous? A very wet photographer at Elgol! So, having dried out, I headed back to my accommodation for the last night before heading back home the next morning. When I was visiting Skye in February, I was keen to get a shot of Eilean Donan Castle. I know that once again this location has been photographed many thousands of times and it’s almost impossible to be original, but I have always loved that scene. When we visited the area back then, we discovered the castle was covered in scaffolding, so that was that. This time, I hadn’t had a opportunity to take any pictures of the castle, but passing it on my way to the ferry at around 9am, I stopped for a quick look, but unfortunately it was a cloudy day with very flat light. However, I could see the clouds moving quickly on this windy day and so I waited and waited, fairly sure the castle would be lit by the sun in due course. Now, I had a ferry to catch, but photography comes first, so an hour later I was still there when the sun finally lit the castle and the dark grey clouds were hanging over the distant mountains. One sequence of long exposure panorama shots with my Lee Big Stopper and I got something I believe works quite well. Eilean Donan Castle, Scotland. Stitched panorama consisting of 6 images, using Lee Big Stopper. It was certainly nice to get another photograph when you think the trip is over and you’re heading home. And, did I get the ferry? I did indeed and, as has been said many times before, the best part of travelling is coming home! That’s until the next trip of course… And what about the midges you may ask? Well, there weren’t any in sight, maybe they just decided it wasn’t quite summer yet! Please follow my future trips by visiting my website at www.johnmiskelly.co.uk and ‘like’ my Facebook page.